Tropical foliage plants can catch cold! Truly! Though most of the plants that fall into this category originate in the true tropics where days are hot and humid and night temperatures don’t drop very low at any time of year, these plants are nowadays grown in a wider temperature range from the sub-tropics to sheltered warm-temperate gardens where there is a decided “down” season when temperatures drop. In the southern hemisphere that may coincide with the “winter” dry season where special care is needed. What’s more, though plants such as bromeliads and many orchids come from the tropic latitudes, they occur naturally at high altitudes where lower temperatures occur and constant cloud cover prevents sun warmth getting through. So they can tolerate – indeed may well require – quite low temperatures at times. So unless you lived on a tropic beach with very little climate variation all year round, read on! The two conditions which can send tropical foliage plants – or tropical flowering plants for that matter – into oblivion are cold and drought. As most warm climates have a season in which little or no rain falls (for example tropical northern Australia, parts of Central and northern South America, India and Africa) and where temperatures are low at night, some tropical foliage plants have developed strategies to deal with this – they go to ground. 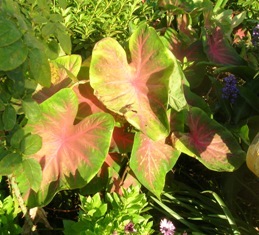 Caladiums and tropical gingers both do this. In fact many popular tropical foliage “indoor” plants have a dormancy period when neither, new stems, leaves or flowers are produced. 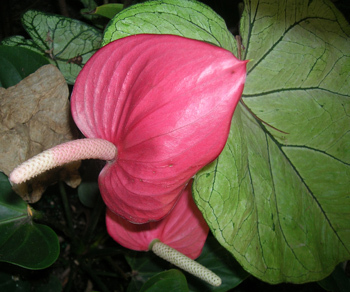 Spathiphyllums, anthuriums and calatheas do this – and so, among the flowering plants, do orchids. This is vital to their life-cycle. This “down” period renders the plant very vulnerable, especially where there is a marked change between summer and winter, high rainfall and low rainfall. The two important considerations here are COLD and MOISTURE. Isolated plants are lonely plants and, just as humans can survive cold by huddling together and using their combined body temperatures to create and share warmth, so can plants. This is especially true of all those plants that we categorise as “tropical foliage” – the spathiphyllums, pileas, aspidistras, calatheas, marantas and others (for a full list go to www.wix.com/jrlakemedia/ezibooks )- which come from crowded jungles. If you are growing these plants in pots you can bring them indoors for the cool season. If you are growing them in the garden then they must be massed together so temperature and moisture levels can be maintained at a higher level than the surrounding air. This massed planting also helps keep the soil warm and moist. Shade from palms and other trees will protect your tropical foliage plants from frost danger and wind exposure. However morning sun is beneficial in cooler weather so create (or recreate)your planting scheme so that it faces the sunrise. In sub-tropical and warm-temperate gardens use palms and briefly deciduous trees such as coral trees (erythrinas) and tabebuias as the overhead cover. These will allow sufficient sunlight to filter through to the plants below in the cool season. DON’T plant your tropical foliage garden where it has no shelter from chill cool-season winds and exposure. Cold, wet ground is the main killer of tropical foliage plants. If these conditions are prolonged they will just curl up their leaves and die. Root-rot fungal diseases thrive when soil is wet and cold and poorly drained. An early warning sign is moss growing on top of the hard-packed ground. I have a corner of my garden that has heavy, poorly-drained soil that gets very soggy in winter when the sun only gets to it for an hour or so a day. This combination is fatal to plants like cordylines and crotons and I’ve lost a few. I now mulch, mulch, mulch to improve the soil and have dug a drain to channel excess water away from the planted area. The other tropical plant assassins are, of course, frost or hail. I get both where I live. If you have sufficient overhead cover light frost shouldn’t be a problem; if on a frosty morning you notice some plants are affected hose them down quickly – though you probably won’t be able to save them. If you live where regular, severe frosts occur then you shouldn’t be growing these plants anyway! Hail shreds the leaves of fleshy foliage plants and there’s not much you can do about it except trim them back so new growth is encouraged – this being a plant’s natural response to disaster. More dangerous is hail bruising of plant stems which can cause deep cell damage and leave the plant susceptible to fungal attack. The same result will happen if the ice remains for any time piled up against the stem. So after a hail storm push back the hailstones as fast as possible and water down the leaves and stems. As with frost, an overhead canopy will protect plants below from the worst of a hailstorm. Of course, hail is usually (but not always) a spring, summer or even autumn problem but I thought I’d include it here because it comes under the “cold” category as far as tender plants are concerned. Don’t, don’t, DON’T over-water tropical foliage plants in the cool-season because few of them make any growth at this time and they can’t use the water – worse, too much of it will cause root rot. Yes, I know these are plants from high rainfall areas that thrive on heat and moisture and our instincts tell us to keep them soaked when the rain isn’t falling. But nature gives them heavy monsoonal drenching alternating with dry periods, or in some equatorial areas a nightly drenching and a daily dry-out. But they are not programmed to be waterlogged all the time. So the only time you need to provide them with water is in prolonged dry periods, especially if it’s windy. In such cases a light, misting spray twice a week is quite enough. Finally, DON’T fertilize your tropical foliage plants in winter (and that goes for those grown indoors as “house” plants, too!). They won’t be able to make use of the extra nutrients anyway. Save your efforts until late spring or just before the monsoon, depending on where you live,then give them a good dressing of blood-and-bone or chicken-poo pellets or well-made compost. So that’s all there is to it. When it comes to getting your tropical foliage plants through the cool-season dormancy period, keep ‘em warm and keep ‘em dry. Bit like babies, really!